Acta Biologica Sibirica publishes original, previously unpublished articles on the following fields: Faunistics, Floristics, Biogeography, Biological systematics, Nature conservation and protected areas, Reviews of published articles and monographs on the above topics, Memorial articles. Preference is given to articles in English. There are no restrictions on the article volume and number of articles in the issue. In the fields of faunistics and floristics, we accept articles of two types: floral and faunal lists on any region of the world (areas, regions, countries, mountain ranges, national parks), and faunal and floral discoveries (finding new species for the regions, additions to previously published inventories…). We also accept articles on methodology of faunal and floral studies. The materials up to three pages are placed in the category Short Communication. Acta Biologica Sibirica is covered in abstract and citation databases: Web of Science (BIOSIS Previews, Zoological Record); DOAJ; ProQuest; Ulrich's Periodicals Directory; OpenAIRE; BASE - Bielefeld Academic Search Engine; Agricola; OAIsters; Agris; OCLC-WorldCat; HINARI; MIAR; OpenAIRE; CAB Abstracts; E-Library.ru. Frequency: The journal is published four times a year in the “continuous publication” mode on 31 March, 30 June, 30 September, 31 December. Уважаемые авторы! С 2017 года Acta Biologica Sibirica осуществил некоторые изменения в редакционной политике журнала, касающиеся тематик принимаемых статей и правил оформления рукописей. 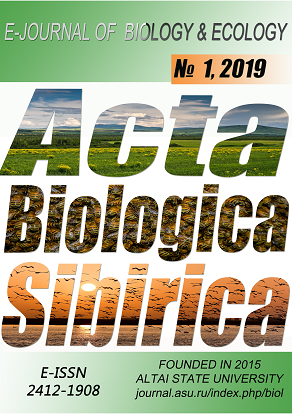 Acta Biologica Sibirica publishes original, previously unpublished articles on the following fields: Faunistics, Floristics, Biogeography, Biological systematics, Nature conservation and protected areas, Reviews of published articles and monographs on the above topics, Memorial articles. We also accept articles on methodology of faunal and floral studies. The materials up to three pages are placed in the category Short Communication.